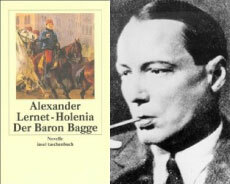 Up to what extent can we consider Der Baron Bagge by Alexander Lernet-Holenia a novel of the Great War? This Austrian poet, novelist and dramaturgist never wrote a book eligible for being considered a complete war testimony like the ones we already pointed out. And yet the First World War is an almost permanent trait of his fiction. We get out (escape?) from the sticky world here represented with a deeper feeling (and emotion) of what the war was, about the spectres in the mind of people who fought it. If from an historical point of view this novel could be filed as the last novel about the corps of cavalry, from a narrative perspective this is probably one of the strangest stories you may read today about the First World War set in the forgotten front line between Central Powers and Russia. This short novel first published in 1936 is both a real and a dreamlike journey of a squadron of Austrian cavalry towards the unknown, a compelling pursuit of the protagonist's gallop in the territories of a misty war and of an almost mystic love (you will read about an extraordinary wedding ceremony... but you will discover it's a dream). This novel is in fact the story of the advance of Baron Bagge through the plains of Pannonia, the former Roman region today shared by a multitude of countries (Hungary, Austria, Croatia, Serbia, Slovenia, Slovakia and Bosnia-Herzegovina), a journey that passes through reality and a long dream (the biggest part of the novel) to land at the end in the reality again. There is deep sense of wait in this novel, something reminding us the atmospheres of The Deserts of the Tartars by the Italian novelist Dino Buzzati. Unlike Buzzati's book and his protagonist (a tenant tied to stillness whose name is Drogo), here we can see and understand a movement (what we called before the advance towards the enemy's line). If we stop for a while and think, we can realize that this is an innovation in the First World War literary legacy, often resembling a stagnating, putrescent and muddy literature. Our impression is that Lernet-Holenia is really helping readers who search in World War One literature a way for a better understanding, but he is successful in this keeping himself light-years away from the manners of Hemingway, Remarque or the Italian Lussu (just to mention some of the most popular names). You may read Der Baron Bagge beside some of other books he wrote. Take for example Die Standarde (The Standard), another novel set during the Great War years, and you will discover how this Austrian writer invents his plots staying at the edges of the war. Or maybe you could dive into the pages of Ein Traum in Rot (A Dream in Red). Some recurring elements are traceable in all these works of fiction and these are 1) the World War that seems present but somehow set aside, 2) love and wedding ceremonies, 3) high society social gatherings and 4) a thin (sometimes feeble and sickly) line between reality and fantasy, between life and dream. In other words, his experience of official during the war in one of the two "eastern" fronts (Poland, Slovakia, Hungary and Russia) will become a great source of the future fiction, a powerful spring from where his prose gushes, like when, just before the Nazi invasion of Poland many years later, he got a second (and very short) call to arms which originated Mars im Widder (Mars in Aries). As we said, the most noteworthy feature of this great master of storylines is perhaps the hint of dream in reality and, viceversa, the hint of reality in a dream. The Italian writer Leonardo Sciascia once wrote that while reading this book you never know the exact point when you realize that the narrator has switched to the "dream mode", after having led you through a multitude of absurd and often surreal details. It's very propable that this will happen to you.